The past couple months have been busy, in more ways than just the academic realm. Sure, it was a stress finishing up the semester and my exams and getting Christmas underway, but I also had a brief transformation of placing things in perspective and focusing on the things I care about vs. the things others may care about. Not sure if you could call it a New Year’s Resolution, but besides the dieting, the exercise, the eating well, I had one goal in common this year…to do what I needed to do for myself, and to be my own person. It’s a weird time, junior year in college, where you start to realize that you don’t need to be around “the group” every waking moment and sometimes what they’re doing or saying isn’t what’s best for you…I’m not going to say I’m perfect with this yet, but I’m at least giving it some conscious consideration as I’ve moved forward in second semester. And I’ve gotta say, I’ve been a lot happier. On the food news, my friend Caroline and I decided to start a New Years Resolution to cook more! She is an avid cook and always whips up stuffed shells, lasagna, or homemade ravioli our house and her teammates. Though I love to try a new recipe, I never give myself the time to do so when I am thinking about the homework I have to get done. Cooking and eating well always falls by the wayside. 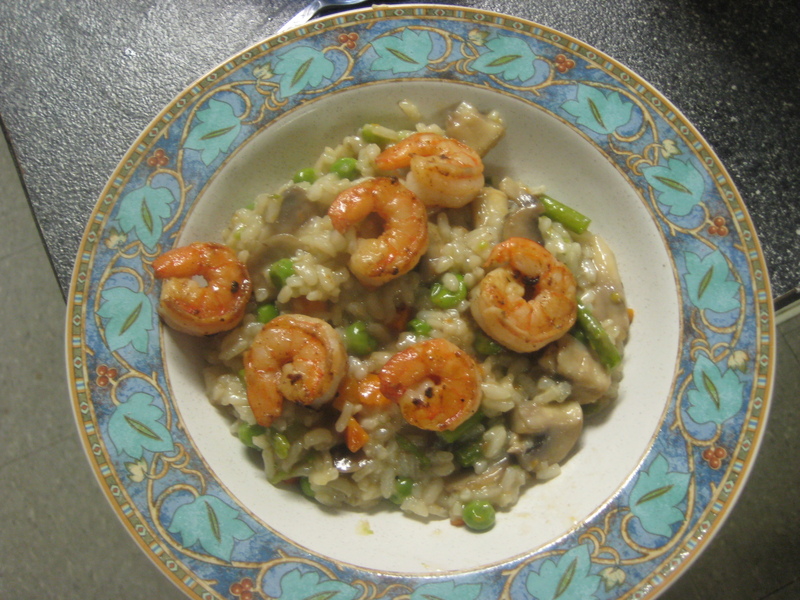 Though we haven’t stuck to our one new recipe a week, we have made some good ones so far including Vegetable Risotto with Grilled Lemon Shrimp consisting of peas, asparagus, carrots, and mushrooms (YUM!) and chicken fajitas. Check out this yummy risotto.. But here’s the final product! 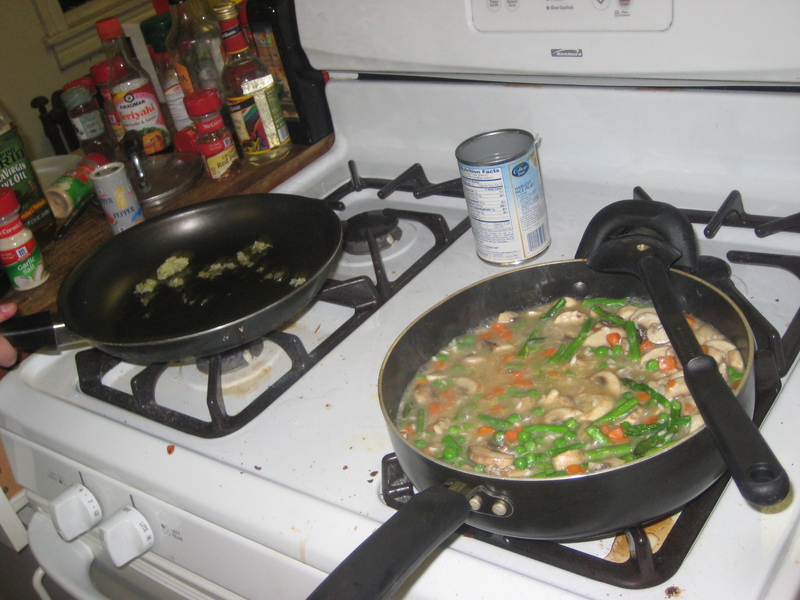 Mouthwatering picture, I would love to remake this sometime, and it required no major recipe except the one on the box of risotto and the combination of whatever ingredients we could think of. Definitely a recreation foreseen in the future. So as for now, I’m going to do my best to keep up with this, not make any promises that it’ll be a daily thing, but regardless of who’s reading it, it’s definitely nice to get some words down once in a while! Lastly, a big congrats to my two siblings who have welcomed the arrival of baby boys this winter! Kate and Evan welcomed Caden John on 12.31.10 and Kevin and Rebecca welcomed Henry Ellsworth on 2.14.11. So many holiday babies and so many little boy cousins! Jack’s going to have to show them the ropes!